Mother Bee Soothing Lip Balm in a 15 grams handy aluminium tub. 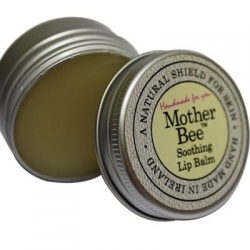 Mother Bee Lip Balm is a naturally soothing Lip Balm and is ideal for people prone to Cold Sores or Chapped Lips. The Mother Bee Lip Balm is easy to apply and can be used on sores or cuts on your lip area. Its unique blend of Beeswax and natural oils heats and protects your lips. A perfect gift to keep lips wonderfully soft. 100% Natural. Beautifully Handmade in Ireland.